"Some women, it is said, like to cook. "This book is not for them. "This book is for those of us who hate to, who have learned, through hard experience, that some activities become no less painful through repetition: childbearing, paying taxes, cooking. This book is for those of us who want to fold our big dishwater hands around a dry Martini instead of a wet flounder, come the end of a long day." 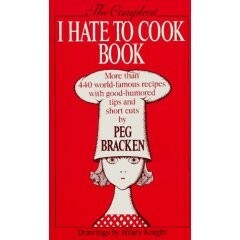 When I was oh, ten or so, I was for a very odd stretch obsessed with Peg Bracken's I Hate To Cook Book. I think I was drawn in prepubescence to its sassy tone and mildly racy intimations of adult vice--Bracken's 1960 masterwork challenged the era's ideal of domesticity, daring to suggest that there might be other paths to female fulfillment and pleasure besides a nice, juicy prime rib. The I Hate to Cook Book emphasized speed and ease (cans of mushroom soup made frequent appearances), which made it all the more appealing to a ten-year-old cook. I turned out out batch after batch of "Elevator Lady Spice Cookies" and "Cockeyed Cake" for tolerant parents and siblings. And when my parents were cleaning house last year my mother's well-worn copy was one of the prizes I snagged--along with other relics of the era like a battered, yeasty-smelling copy of the Tassajara Bread Book and the complete Sunset magazine series of ethnic cooking guides, which now, all lumped together on the cookbook shelf, comprise a disturbing survey of the erratic culinary landscape of the Bayne household circa 1978. All of which is to say I was quite surprised by the prickly shock I got yesterday when I heard that Bracken had whipped up her last pan of Skid Road Stroganoff.